VATS, these four letters can instill fear in even the most stalwart of Corvetter. 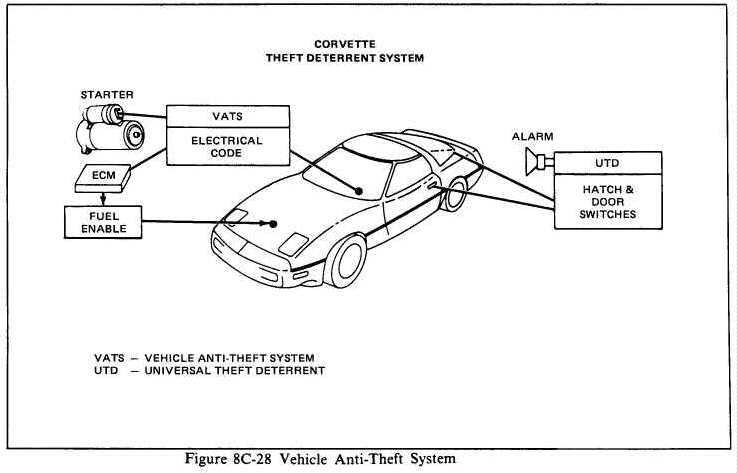 The Vehicle Anti-Theft System was introduced to the Corvette for Model Year 1986 and has been a thorn in the side of many 1986 - 1988 Corvette owner. At this point a discussion of the system is in order as there are many misconceptions concerning this system. 2. Close the starter circuit. Without a signal response from the VATS module, the ECM will not allow fuel injection or starter operation. VATS is not connected to the alarm system, so it is active even if the alarm system is defeated, or if the car is left unlocked. The two main components of the system are the ignition key with resistor pellet and the VATS decoder module. The pellet in the key is just a resistor, it will be one of 15 specific values. The ignition cylinder has contacts that connect between the two sides of the ignition key pellet. Wiring carries this resistance value to the VATS decoder module, where it is compared to the value stored in the module. If they match, the car starts. If they do not match, the starter circuit and fuel injectors are disabled. A timer (approximately 4 minutes) is also activated if an improper resistance is read. Each time an attempt is made during this delay period, the timer will be reset. So it is important to wait at least 4 minutes before another attempt is made. The main problem with the system in the first three years of production was the material that the contacts of both the ignition key and ignition cylinder were made of. This material was prone to premature wear, causing poor contact, an incorrect resistance being seen by the decoder module and a no start condition. This caused embarrassment when your shiny Corvette wouldn't start and your significant other laughs uncontrollably and offers to drive you in her Civic. It also causes inconvenience and more embarrassment when you need to call the AAA for a tow. Band-aides were developed that would fool the decoder module. These Band-aides bypassed the key pellet and the ignition cylinder contacts. The VATS Bypass Modules that you see in the Corvette catalogs cost anywhere from $30 - $50. Add to that shipping and sales tax where applicable and youre looking at $35 for a resistor that you can pick up at Radio Shack for under $1! Another problem with the bypass modules is that you have to know what code value (1-15) to buy. That means you'll have to go to a dealer that can use their VATS Interrogator. If you take a multimeter and measure the resistance between the metal contacts on either side of your key, you can buy a resistor of this value at any Radio Shack store. ¼ watt will do. You then need to remove the hush panel under the steering column. Disconnect C281 (two-cavity connector at base of steering column with two black wires in the female end and one yellow and one brown wire in the male end). Your newly purchased resistor goes into the male side of this connector, so you'll need to crimp a couple of female pins to the resistor legs. If you insist on purchasing the VATS bypass from one of the Corvette catalogs, again measure the resistance of your key pellet and compare it to the code chart to find your code. It is also possible to reprogram the PROM to ignore the VATS signal, but that is beyond the scope of this article. The real fix came from GM in July of 1988 as TECHNICAL SERVICE BULLETIN number 88-292. This TSB includes the part number for a new ignition cylinder that has better contacts. Keys have also been updated that are slightly longer and have the better contacts. This virtually eliminates VATS problems caused by connections. You still want to keep your key clean and dry, but with the TSB competed, you should enjoy VATS problem free starting for a good long time.